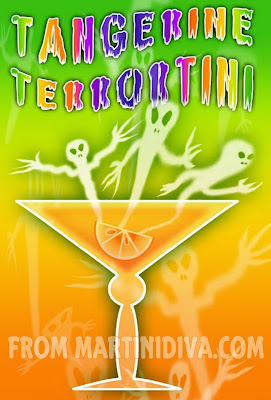 The Tangerine Terrortini is overflowing with vitamin laden spooky spirit thanks to the fresh tangerine juice mixer and tangerine slice for the garnish. Doesn't hurt that it's orange and really tasty either. I add a little extra spook to the spirits with a Halloween colored sugar rim sometimes and it's also fun to shave a few slivers of dry ice on top just before you serve it for the ghosts to escape! Just make sure you handle the dry ice with gloves and only shave in small slivers so they'll melt before your guests take a sip.